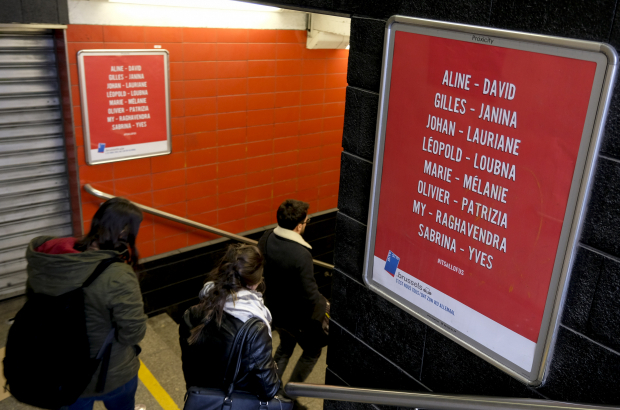 Brussels transport authority Stib has replaced the advertising normally found on the digital screens in Maelbeek metro station with names of the victims of the terrorist attacks of 22 March 2016. Thursday is the two-year anniversary of the attacks. On the morning of 22 March 2016, two suicide bombers detonated explosives in the Brussels Airport departure hall, while one suicide bomber blew himself up in a metro that had pulled into Maalbeek station in the European Quarter. The attacks took place within an hour of each other. Thirty-two victims were killed, half of them at Maelbeek. The station will also hold a minute of silence tomorrow at 9.11, the moment of the explosion, in the presence of prime minister Charles Michel. The victims’ names will be recited over the loudspeakers. Brussels mascot Manneken Pis, meanwhile, will be dressed as a firefighter for the day, and a fire engine and ambulance will greet him with a minute of noise at 11.00. As last year, a memorial football tournament was played on Tuesday at the Zaventem football field. More than 30 amateur teams from Belgium took part. In related news, the federal prosecutor’s office said that the trial of those involved in the attacks would begin next year. There are 10 suspects, though not all of them are expected to be part of the jury trial. Two men, however, will definitely be put on trial: Mohamed Abrini, who was present at Brussels Airport and fled the scene when his bomb didn’t detonate, and Osama Krayem, who was seen in video footage at Maelbeek metro station before the blast that took place there.